In the winter of 2013, Vid Petrovic traveled back to Jordan for the 7th World Archaeology Congress to present our recent archaeological visualization field work from the projects in southern Jordan. This paper describes a visual analytics technique that integrates with the cyber- archaeology data acquisition pipeline and workflow, allowing massive point sampled data collections to be explored intuitively and interactively with minimal a priori processing. The immediate-mode exploration of spatial and temporal relationships documented via Light Detection and Ranging (LIDAR), Structure from Motion (SFM) and other surveying techniques applied at archaeological sites is explored in the context of hybrid, interactive rendering, combining rich 3D point clouds with 2D visuals and metadata. This rendering approach enables a unique form of scientific story-telling, while sifting through the massive data avalanche that is being created by cyber-archaeology. 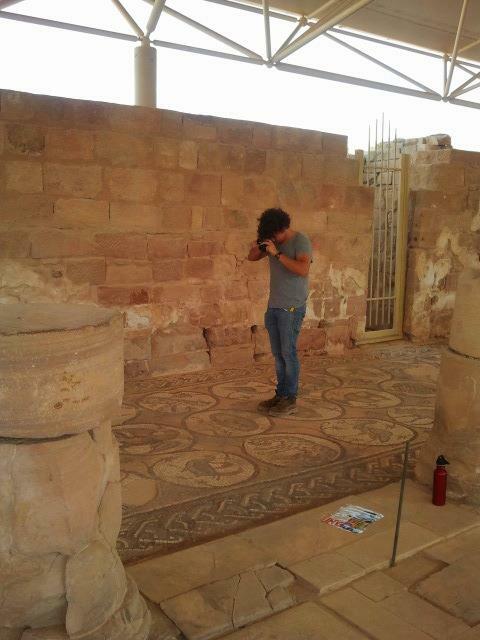 Vid Petrovic imaging at the Byzantine Mosaic Church at Petra, Jordan. Tagged archaeology, Ashley M. Richter, Center of Interdisciplinary Science for Art Architecture and Archaeology, CISA3, computer science, Cultural Heritage, Cultural Heritage Diagnostics, cyberarchaeology, data integration, Digital, digital archaeology, engineering, Jordan, laser scanning, structure from motion, technology, University of California San Diego, Vid Petrovic, visualization, WAC, WAC-7, World Archaeology CongressBookmark the permalink.